Mixing concrete planes with steel, stucco, ipe wood and a glass circulation volume, the Drexel residence thoughtfully responds to its street context and the needs of an active young family. The house's U-shaped massing emphasizes indoor-outdoor connections between the pool-surrounding gathering spaces on the first floor, while sheltering them from the noise and busy-street views in front and future high-rise to the rear. When entering from the glass and wood front door into the double-height entry space, the house reveals itself slowly. A modest guest suite and private office flank one side of the foyer, while the mud room leading from the garage and motor court flanks the other. 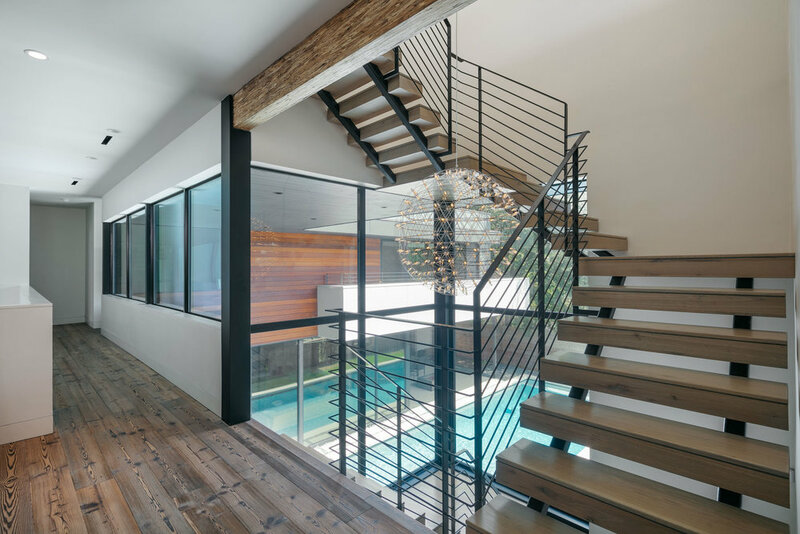 Progressing further, the space dramatically opens both horizontally and vertically with a double-height dining room and glass stair tower. The kitchen, dining and living spaces have unobstructed views to the pool via floor-to-ceiling glass panels, as does a music nook for a piano, drums and violin, neatly tucked under the stair. The kitchen with built-in breakfast table is separated from the dining room by a custom glass-and-steel wine cabinet, while the adjacent living room opens to the covered patio and outdoor kitchen. 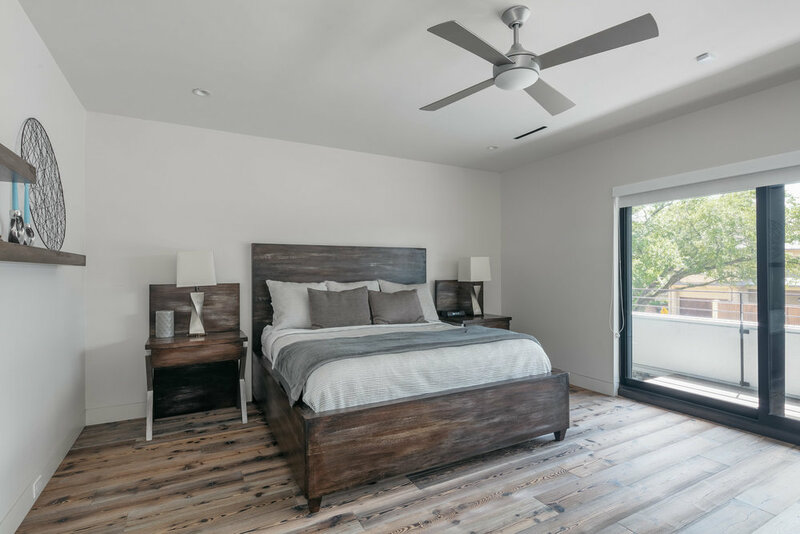 The upper floors include a family room with a yoga terrace, three secondary bedrooms with private baths, a master suite with a private balcony, and a third-floor treetop terrace. 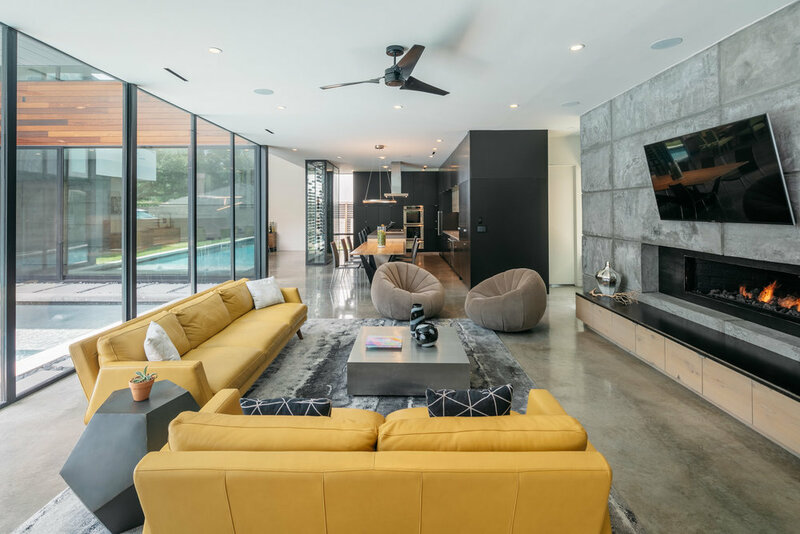 The house creates both private and social spaces for the family and guests, while invoking meaningful nostalgia for the owners through material selections appropriate to time and climate. The concrete planes visible on the exterior also penetrate to the interior to contribute to the blending of interior and exterior space.